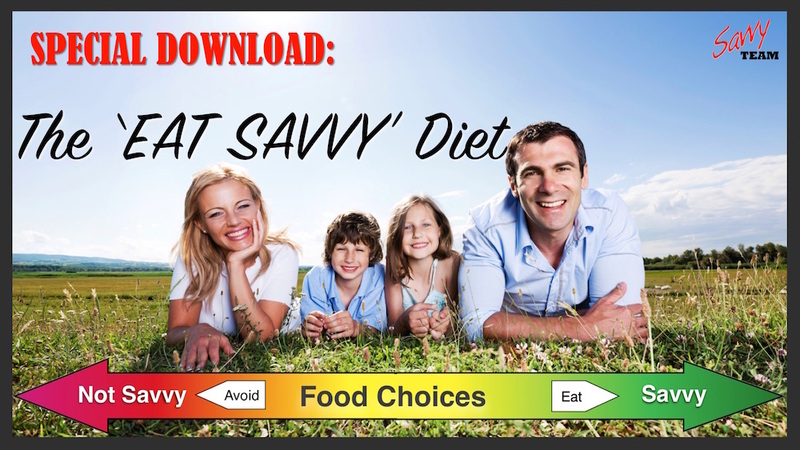 Eat Savvy Diet — You'll find our special reports are loaded with helpful information!Eat Savvy Diet – You'll find our special reports are loaded with helpful information! Here's just a glimpse at what you'll find in this download . . .
'Debunks' some of the diet lies and misinformation you've been told by the media that could be keeping you fat and tired! Start the journey towards a healthier, stronger, more vibrant YOU! DOWNLOAD FREE - for a limited time! A breakthrough compilation of research-based dietary philosophies, that the whole family can follow! YES, I want the Eat Savvy Plan! We'll also touch base by email from time to time to keep you 'in the loop' with relevant wellness related info and our latest research findings through the 'Healthy Wealthy Wise updates. You can unsubscribe at any time. "Thank you for the Savvy Weight Management programs - my health has improved and my joints have become more free moving and I'm sleeping better too. On talking with Corey, we decided I needed some time on the Phase 1 Detox before focusing on shedding my weight. However Corey advised me to use the Eat Savvy Diet as well, but not to try to lose weight but to 'practise' eating better by aiming for the green in the Eat Savvy approach. I've lost 20kg just 'practising' and I can now see I put weight on when I'm NOT Savvy! I'm going for another 15kg so I can go surfing with my son."